I wish that everyone who is addicted to social media and the internet could read this book. There is nothing wrong with social media, but we all need face-to-face contact as well. The message this book delivers is critical to our happiness and well being. I have experienced this first-hand recently. I took myself away from the computer and visited a distant cousin one afternoon. After our visit, I felt so good. We reminisced about our childhoods and I experienced the warmth of her smile. We can reminisce on Facebook and in emails, but we are deprived of the other persons smile, twinkling eyes and laughter. Video cams might deliver those visual things, but they cannot capture the aura of being with another person. I remember reading about Harry Harlow and his studies with rhesus monkeys. Harlow found that baby monkeys without playmates or real mothers became socially incompetent. We humans are like those rhesus monkeys...we crave contact with others of our species and we thrive from that contact. I have recommended this book to all of my Facebook friends. If you only read one book this year, please read "The Village Effect." Besides being a well-written social psychology book, this spoke to an increasingly deep yearning in my life: to do a better job connecting with real people, face to face, who are part of my broader circle of friends.Has the Internet given me unprecedented reach to others and ways of connecting with old friends I had lost touch with? Of course. But as Susan Pinker demonstrates, study after study have shown that meaningful personal contact can lengthen lifespan, increase children's ability to read and learn, make dating and marriage real and lasting, and make businesses more profitable and better places to work.She spans many of the studies that have been done, from Sandy Pentland's work with personal monitors showing how people interact in the workplace, to Robin Dunbar's brilliant work demonstrating how 150 is a magic number for the number of personal, closer relationships a human being can have.She ends with commonsense recommendations on how to increase the meaningful and healthy personal relationships in our lives, and she writes gracefully and straightforwardly throughout. Pinker connects some fairly disparate seeming facts: people in Sardinian villages have some of the world's longest lifespans; people with serious illnesses are more likely to survive, the more people they socialize with regularly; computers, ipads, and tablets in classrooms do not increase student performance; children who are read to learn more and develop better social skills. The connection she finds and argues for, with a dizzying array of experts and studies in support, is that face-to-face interactions with other people have measurable impacts on human health and happiness. As someone who is not terribly sociable and has never had a lot of close friends, I find her argument a little disturbing but Pinker does include studies of introverts. They do tend to die earlier, suffer more depression and earlier dementia, and so on, if they don't have the social feedback of face-to-face interaction, even if they need less of it or fewer contacts.Her chapters on education and young people are fascinating, too, because the science seems to show that online friends and interactions do not have the same effect as face-to-face interactions and actually tend cause loneliness and depression. Television, computers, and mobile phones are harmful, she finds, not so much because of what they do themselves but because of what they *replace* -- meaningful interactions with other humans and the opportunity read other's body language and responses to us, which we may be biologically predisposed to need. Fascinating and well worth reading. Did not manage to finish this book. The information is interesting enough, but its presentation is scattered and not compelling. I often disliked the way the author presented statistics, implying or claiming causation when there was no basis for anything but correlation. Face to face contact is great, and I was looking to arm myself to take up its banner with lots of facts presented as part of an entertaining, cohesive argument. Instead, I was slammed over the head with something like this. "On the topic of longevity, there was this study that showed.... and there was another study that showed... and there was another study that showed..."There are more interesting (and accurate!) ways to discuss research, Pinker. Please look into them. A fascinating book that has helped me unravel the mystery of why my time in Mexico is so healing for me. I don't have the same life responsibilities there, have no tv and little availability of phone, so I am freed up to enjoy the smorgasbord of face-to-face contact that studies have shown extend life by "fortifying your immune system, calibrating your hormones, and rejigging how the genes that govern your behavior and resilience are expressed." I have the time to talk daily with my tight but diverse community. Author Susan Pinker has handed the baton to me. It is now my responsibility to build social interactions to all aspects of my life. The life I am saving is mine to save. Very interesting book - made special effort to talk to my children rather than text them and have been persuading Scott he needs to marry me for his own health benefits as well as my own. Let's live in a commune - it's good for our health, I like that idea. I liked that this book was peer reviewed by Stephen Pinker, Susan's brother and Daniel Pink (author of Drive) - what a lot of pinkness. I read/skimmed this book for my thesis paper.The basic argument of this book is that people need face-to-face interaction. Unfortunately, today there is less and less relationship and community; instead there are virtual communities and online interactions on social media. These, however, don't cut it. Studies have shown that we need actual person-to-person (in real life) contact with others. If we do this, we will be smarter, healthier, and happier. I picked up this book because, being a social media user, I was curious about what the author had to say on this subject. I have to admit that by the end of it my little introverted self is actually looking forward to getting out there to meet more people. It's something that has wavered throughout my life, and while I'm one of those who feels she has a strong online support system, there's just something about face-to-face interaction that just can't be beat. There were some sections of this book that I found really interesting and others that I ended up skimming through because they weren't relevant to my situation.I really liked the section where the author visited a village that boasts the most 100+ year olds because I can't imagine living that kind of life where you grow up and know your neighbors and basically take care of one another and the elders until it's your turn to be taken care of. I'm now living many states away from my family and don't even know my immediate neighbors' names or even recognize what they look like. Growing up it was a bit different but not to the point described in the book. I guess when you're a little isolated town/village it's bound to happen. :)A chapter I found surprisingly interesting was the one on business, and how companies are seeing a change in productiveness (for the positive) and profit from giving employees a chance to chat. So simple, yet the results were very noticeable. Susan Pinker wrote a tremendously fascinating book. She investigates the link between an active social circle and its effect on health and longevity. She punches several sacred cows that deal with internet contact and how it fails to live up to it's grand claims. In the book a study was commissioned to explore the effect a parent's reassurances had to a child about an upcoming test. The most effect came from face-to-face interaction. The second from a phone call. Turns out a text message made practically no effect on the child. In other words it was just as good as saying nothing. Human interaction and communication best takes place in person. There are things that just cannot be said online and topics were nuance should be prized above brevity. She gives a handy prescription at the end that emphasizes that being isolated behind a screen talking to electronic avatars is not the same as a living in a a real village. Goodreads really should have a zero rating or an "avoid at all costs" rating. In absence of those ratings I had to give this book a one star as that is the lowest permitted. I am not a medical doctor, nor have I reviewed the numerous studies referenced by the authors in this book. That being said, my common sense BS alarm was screaming as I read this book.The authors claims that studies shows that face to face contact can increase life span by up to 15 years and lead to illnesses recovering more quickly. They then claim that studies show that stress has no impact what so ever on cancer causation and recovery time. Again, I am no doctor or academic, but something seems amiss with how these studies were positioned in the book.I also found that the book stated the obvious about virtual vs. in person contact and how the internet has changed this paradigm.Skip this one, it's not worth your valuable time. Very insightful with research to back up topics presented. The conversational tone presents topics in a way all experience levels can comprehend. Whether you are researching the topic or a curious amateur this book delivers. So many great insights! A must-read for anyone who works in community run organisations or management, but really for everyone! The perfect technophobe antidote to the tech craze right now. Basically a bunch of studies after studies after studies of face-to-face interaction being seen as our natural state (Of course) which people don't get enough of in our alienating modern world. She (the author) repeats herself about 1000 times regarding the same type of stuff she writes about and it made my head spin and have some trouble getting through the whole text without getting bored to bits. Though there are several very interesting factoids that are shared throughout. One, or rather several things that turned me off is there's a big Jewish slant to the stories she shares which personally has me jaded beyond belief given that's a huge thing for a lot of writers nowadays; and then this is a sociology book that regurgitates the same information other sociology books have shared about their social science which makes you kind of annoyed at the same stuff being said (doesn't it?). All in all, an alright book to have handy when you're waiting in line at the doctor's or something, but not exactly a book you want to read for complete leisure and to use up your personal time with. A lot of it I could've just read about it in one scientific article essentially, and not 280 pages. Medicare book, pulls on credible sources and good works such as Danny khanenman but seems more of propaganda "women good, social interaction good , technology bad" as it doesn't offer any real solutions or strategies to declining social networks or face to face interactions just repeatedly drills that's it's happening and the effects are negative . The work seems incomplete as she doesn't explore cause of this shift or suggest viable examples of overcoming social isolation . Go build yourself a village is not exactly profound or insightful advice. Interesting subject and how important face to face communication is, not FB or Instagram or texting , but real face to face. In my opinion the author could have shortened the book by a few hundred pages and she would have still gotten her point across. I felt like she was beating a dead horse by the end. This book really had an impact on me. Discusses the value of face to face time, and this book IS must read for those in the middle of life and seniors. My review isn't doing it justice. The book backs up with science how important face to face time is, for our mental well being. Very powerful message. Quite dense but very interesting. Reaffirmed my belief in health and social relationships and the last section actually gives you implementable ideas, which is helpful (although I feel there could have been an extra whole book written about that). A quick read. A good overview of the various studies that show why community and face to face personal interaction is important and why social media or online communication can't compare or provide the same benefits. Not all the chapters were relevant to my interests, but everything I read was top notch. The book is also well written and very readable. Recommend it along with her recent TED talk. I saw this in a bookstore in Matakana, and the title intrigued me. I picked up a copy from the library, and found much that interested me. Pinker highlights research that suggest full social lives/ an active social network is good for the health. Her research in this area began when she found a remote Sardinian village where men lived on average as long as the women. Much of the book demonstrates examples of research that show the importance of face to face contact to our health and happiness. Particular research that interested me as a parent and teacher were the following.1. The dividends that having sit down meals with your children pays in a child's learning.2. The importance of reading aloud to your little toddlers. Programmes for disadvantaged children that have issued free books and showed parents how to read to children have had huge success in preparing children for school.3. The impact of screen time on young children is serious. In a Canadian study on the effect of TV viewing on toddlers, it was found that every additional hour of TV exposure corresponded to a future decrease in classroom engagement, maths ability and an increase in behavioural issues, social problems at school, and higher body mass. This is not to mention unhappiness. The suggested reason for this is displacement. Screens displace real social interaction, which is how language is learnt. 4. Despite the 'image' that technology such as laptops in schools is the way of the future, there is no evidence to show that it boosts student achievement. Quite the reverse in fact. In a study by Jacob Vigdor and Helen Ladd, students who gain access to home computers between grades 5 & 8 tend to witness a persistent decline in reading and maths. Introduction of the internet to their diet does the same!5. Although many well-meaning educational leaders espouse giving free laptops to children in lower soci0-economic areas to level the playing field educationally, this in actual fact leads to widening gaps. Laptop/screen use has a more negative effect on students who are already weaker. 6. MOOC (massive open online courses) which are digital classroom environments through which courses are run do not have a high success rate. 90% of students drop out (according to one study of some American MOOC's) and only 3% find the courses satisfying. 7. The push towards digitalised classrooms seems likely to widen the educational gaps. The quality of the teacher is the most important factor in education. If anything, more screens can take away from this. Parents who can afford it are moving away from digital classrooms. Alan Eagle chief technology officer at Ebay writes, "If you can afford good teaching, why would you entrust your kid's education to an operating system? Digital skills are now so basic they're like learning to use toothpaste. We make technology as brain-dead easy to use as possible. There's no reason why kids can't figure it out when they're older."8. There was also an interesting section with studies showing that 'educational' TV / apps for preschoolers are not actually that effective educationally.9. Marriage (apart from bad marriages) reduces the chances of dying young from all sorts of courses. Married men in developed countries live an average of 7 years longer than their single counterparts. THE VILLAGE EFFECT - I think the simplest thing I learned from this book is we are definitely in need of human contact in order to survive. In this review when I use the term social network, I do not mean an online network, I mean human contact with family, friends and acquaintances.Ms Pinker has studied a new field – social neuroscience. And it seems to me, the basic conclusion is – people actually need other people in their lives.Face to face contacts and human connections make for a healthier and longer life. There is a great amount of evidence, including a study of a group of villagers in Sardinia who consistently live to be 100 or more. The “village effect” illustrates that when one human has many connections to other humans we remain healthier longer and that means a longer life. When one person can share concerns and cares with another person that is a good thing.As a woman, the findings that show women being more adept at connections and influencing those around them when the connections are in person were encouraging. Women influence everything from consumption of alcohol to the way babies grow and mature.The development of technical “social networks” has created isolation in much of the population. The isolation created has changed everything when it comes to relationships. Teenage girls who have a strong social network are more able to resist sexual activity and avoid pregnancy. That fact alone means that their lives will not be permanently altered because they have family and friends who care about them. Facing a devastating illness is never easy but it is easier when we have a large network of people who care about us. Families survive disasters more easily when there are people around who can listen and commiserate with them. Whether those disasters are health related or of some other sort, facing the world supported by others means the results will not be quite so devastating.All over the world, loneliness in the elderly can exacerbate illness and shorten lives. A sense of isolation creates a sense of loneliness that is difficult to overcome without face to face connections.This book is very well written and brings so many points to the reader it is mind boggling. Something as simple as women visiting new mothers in India can help the new mother and her infant thrive. In Japan, the elderly who have a personal support system remain healthy for a longer time.Being able to share our lives on a face to face basis not only keeps us healthier but makes life better. And realizing that we need one another more than we need a computer connection seems very simple to understand. Our brains are wired to live with one another, to care about one another and survive with one another. I received this book from the publisher in the hope I would write a fair and honest review. All thoughts expressed are my own. Very timely for a world drowning in digital devices. This is a fantastic book that couldn't have come at a a better time. As people are increasingly relying on electronic communications for everything from personal communications to education and business meetings, we need to be constantly reminded of the importance of face to face interactions.Not that this book stops at being a simple reminder. It educates thoroughly, diving deep into the scientific research surrounding human interactions, and the effect we have on each other. I was amazed at what so many of the studies have shown about how our interactions affect our health and well-being, and the ways in which the lack of interaction, and reliance on technology as a substitute, can damage us, and our children.The author cites a huge number of research studies in this book. There are 60 PAGES of end notes. Needless to say, the book is very well researched. It is comforting to see how much time and effort we humans have undertaken to study our relationships and interactions with each other.I found myself reading many of the study results out loud to my wife. I couldn't help myself, it was too interesting not to share. And anyway, what better way to share a book about face to face social interaction?Highly recommended.I entered a drawing and won an advance review copy of this book. I'm very glad I did; I might never have encountered it otherwise. 4-stars for research and presentation. 1-star for novelty of the info. 1-star for personal usefulness (to me). So, on average 2 stars. Most thinking people already know that humans are social animals, ergo socialization is good for many outcomes, and lack of it bad. For me (and no doubt some others), her message is akin to how-to-succeed in stocks: "buy low, sell high." Not practically useful. Being a life-long loner (eg, me) is a consequence of many factors (personality, genetics, nurture, rejection by others, etc), and makes it almost impossible to become a "joiner", even if you were to enjoy the face-to-face company of others (rarely in my case) or wanted to mix-in. Especially at age 71. So, if you're like me, just keep going to the gym and avoid cigarettes and junk food. I have, over the years, made the effort to join some groups (and show enthusiasm), but invariably after time, sometimes years, it was clear (I'm slow to pick up on signals) that my presence wasn't appreciated and my enthusiasm not reciprocated. Now, older and wiser, I don't bother 'reaching out.' Conversely, if you're popular to start with, her book is a waste of your time. 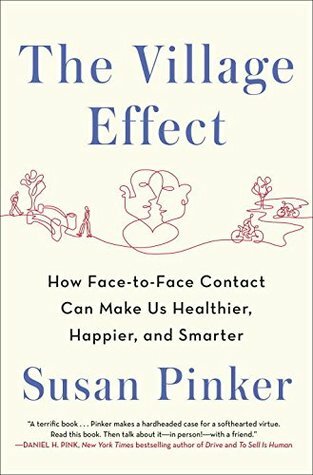 Susan Pinker's book is all about how important it is to spend time with people- which may have you wondering how she wrote a whole book about it. It turns out there's a whole world of research that looks into how meaningful human contact benefits us in a host of ways, from health and longevity to social contagion and infant-mother bonding. Pinker walks us through the research, from the Sardinian villages where men live as long as women to the social networking sites that don't seem to provide the same benefits as talking face-to-face, to the ways that a healthy lifestyle or obesity can spread through social circles. In an age of cell phones and Facebook, and declining participation in social gatherings like bowling leagues and PTAs, we may be losing out on just what we'll need when we suffer some setbacks- losing a job, or spouse, or facing down cancer, and Pinker makes a good case for why we should all call a friend, join a swim team, and just relax with family- you probably want to anyway, but this book backs that desire up with some surprising science. Susan Pinker - Susan Pinker is a developmental psychologist who writes about social science.